Handcrafted Soap and 3D Printing! 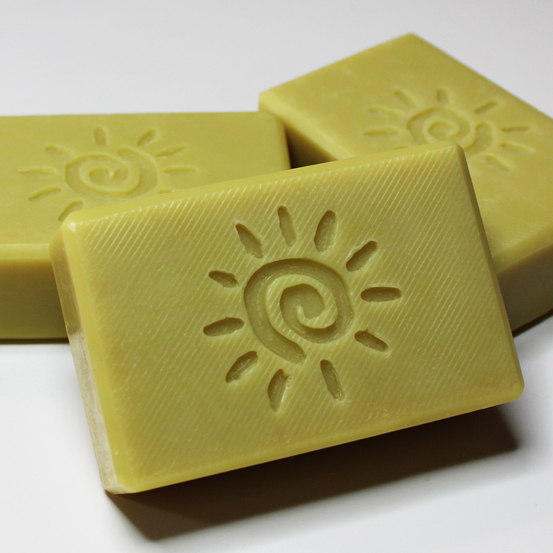 Here Comes the Sun ~ a handcrafted soap with a lemon like scent made with litsea cubeba and yuzu essential oils. A couple of years ago, I kept hearing about 3D printing; it seemed like a great idea, but not realistic for my business. My current thoughts have been how to help my soap business, Magellan’s Gift Micro Soap Company, to survive in a highly competitive field. I needed to work smarter and faster. The profit margin on a bar of soap made with great ingredients is low – I have to be able to make a whole lot of bars to have an income. Soap making is labor intensive. Having an expensive hobby is not an option for me. The goal is to produce artisan bars that can give a great shower experience and leave the skin clean without stripping natural oils. Also, create different types of soap for different types of people and make it fun with a little attitude. I like to encourage people to use their shower as a chance to clean off the troubles of life and dream of adventure. All this without practicing medicine (without a licence), witchcraft, hunting mermaids or making miracles! One of the biggest time wasters in making soap is washing out equipment. For an example, swirling soap means more containers to wash, especially if you’re trying to be an eco-friendly company and don’t use disposable containers. My hand stamped soaps are just as popular as my swirls, but very time consuming and temperamental. In 2010 I fell in love with impression mats for rolling out fondant cake icing. It is so easy: just place an impression mat on the bottom of your mold, pour soap, wait a day or two and remove the mold and then peel off the impression mat. Soda ash that forms on the top of soap (a cosmetic problem) is a non issue, because the bottom becomes the top. Unfortunately silicone impression mats, come in a limited number of patterns for molds my size and I really want custom designs. The best solution is to make my own custom mats out of silicone, but I’ve got soap to make and not much time to play – perhaps in 2016? Late last summer I noticed in downtown Harrisonburg VA a 3D printing shop. I just had to check it out. The shop, named Hatch 3D, whose goal is to let people create things they dream up, has many 3D printers and staff to help you out. And so started several little trials with two 3D printing materials: NinjaFlex and SemiFlex. I started with a tiny mold from Brambleberry.com, perfect for little experimental batches. 3D Hatch printed a little mat made with SemiFlex with a leaf design for the trial. It worked and stayed in place with very little soap getting beneath the mat. Next, I wanted to try a more flexible material called NinjiFlex. This time I wanted to pour on to one of my HDPE divider molds made by SoapHutch. The mold has an existing silicone liner/mat and I wanted to know if the 3D little mats would cling and not get disrupted when I poured the soap. I poured a swirled batch of soap as pictured and even dragged a chopstick across the little mat and it didn’t budge. 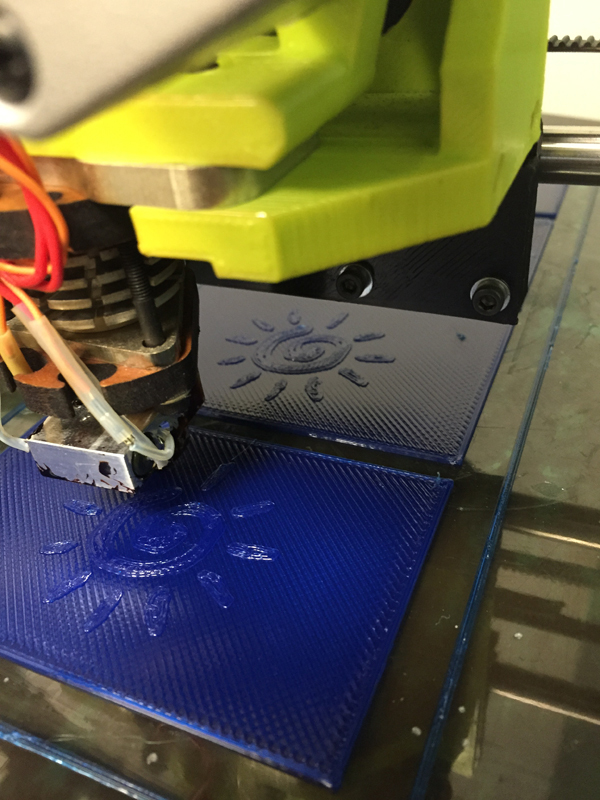 A shot of the production of the little soap mats made by a 3D printer. Check out their website: http://www.hatch3dva.com I truly enjoyed working with their staff. I had to go with little individual mats because the printers could not print the size of my molds. This at first seemed to be a problem, but the upside is, if you have a customer that wants a small number of bars with their logo – no problem! An example is a real estate agent that wants to gift every new home buyer a bar of handcrafted soap with their logo or image. They may only want a few bars a month, so you can place their design in part of the mold and the rest in your images. The 3D printing process leaves extra little strings that have to be removed before the mats are ready to be used. This is kind of tedious. Both the materials I tested – NinjaFlex and SemiFlex aren’t as nice as silicone for ease of removal. I did have a sticking issue with the recipe I wanted to use. That was easy solved by removing them from the mold and stacking them in the freezer. I forgot them and easily removed the little mats the next day. The big question for me is: will the little individual mat continue to cling to my old silicone mats that line my molds? As to which is better NinjaFlex or SemiFlex? Next week, I will be revisiting the SemiFlex in my next pour of my soap called, “Here comes the Sun.” I’m also planing on working on a spearmint leaf design for my spearmint scented soap. So, 3D printing impression mats, in my mind, are still a gamble and only time will tell, but I sure love the journey! The little mats are loosing their ability to cling to my existing silicone mats. A product called Anchor Dit by http://www.makeyourownmolds.com is working to help them stick. Anchor Dit does not have to be re-applied each time (even after washing) that the mats are used. ← Dark Forest Scented Handcrafted Soap! I’ve been working on the same problems you (we) all have. Not enough time and to make more (or at least the same) profit. Right now, 90% of my soap is private label. But – the same problems. Handling, stamping the soap so many times, it’s a wonder I don’t wear the bar out before I get it packaged. So, THANK YOU for sharing this 3D printing information. You are a princess among the suds. I needed the “conformation” with the direction I have been going. Nice to know I’m not alone. When I get my 3D printer, I’ll keep you up to date with what I encounter. Yup, “loving the journey” – what a trip!! Thanks for the feed back. This makes the journey worth it all!